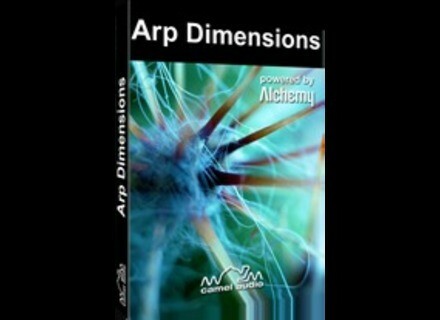 Arp Dimensions, Ambient / New Age Sample from Camel Audio. Camel Audio has announced a new release for those of you looking for flexible arpeggiated sounds: Arp Dimensions. Camel Audio describes Arp Dimensions as "a bubbling world of cascading melodies, pulsating soundscapes and layered riffs. No static arpeggios here – each preset incorporates extensive programming options to offer a seamless mini-world of evolving possibilities. This library is perfect for genres as diverse as electronica, dance and ambient, all locked in perfect sync to the tempo of your track. Many patches have a dedicated knob for switching between multiple arpeggiated patterns, so it's easy to make them fit your music." Camel Audio has also released a free bonus library of 50 presets for all Alchemy Player and Alchemy users, bringing the total number of sounds included with Alchemy Player to 200. It contains 150 presets and works as a standalone instrument when used with the included Alchemy Player and costs $59 / €49 / £39. MUTOOLS MuVerb VST MUTOOLS has released MuVerb VST, the first VST plug-in based on the MU.LAB technology. Sonoma StudioTrack for iPad v1.3 Sonoma Wire Works has announced that StudioTrack, the multitrack audio recorder for the iPad, has been updated to version 1.3. Universal Audio Studer A 800 Universal Audio has announced the release of the Studer A800 Multichannel Tape Recorder plug-in for the UAD-2 platform.